The is a project work which is aimed at revealing the benefits of computerization in the promotion process of the local government system, especially as it concerns the staff of the local government. The project explained the way promotion process of the local government staff in Oruk Anam local Government Council is done. It has as its main purpose and other to advice the Oruk Anam local government Council on the benefits of computerization in the promotion process. This is to increase speed and accuracy of processing promotion records for effective promotion to encourage efficiency and productivity in the local government system. 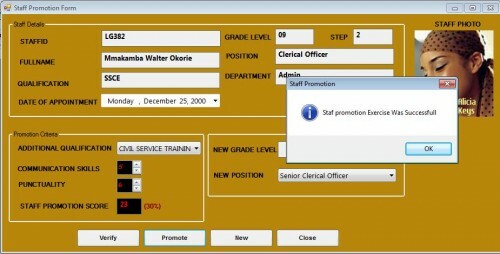 Our staff promotion System was design using Microsoft Visual Basic.net 2010 and Microsoft Access 2003 as front-end and Back-end respectively.